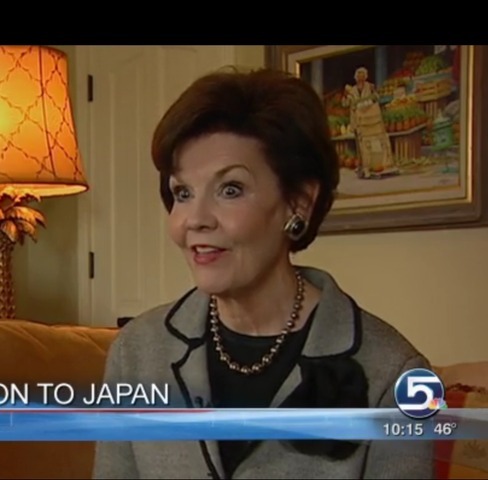 For the wife of an apostle of The Church of Jesus Christ of Latter-day Saints, the devastation in Japan feels personal. "They have such respect for Americans and they are such friends to us that I feel that I personally have an obligation to do anything I can to help them," said Kristen Oaks. That desire to help comes from a long association with the people of Japan. Sister Oaks served a Latter-day Saint mission in Sendai decades ago. Now as the wife of Elder Dallin H. Oaks of the Quorum of the Twelve Apostles, she has traveled there with her husband three times in the last three years. "I was in tears because there was face on what was happening," she said. Watching the horrors unfold particularly painful for the former missionary.